An oldie but a goodie - still love this band. Thanks for stopping in again today - so lovely to have you all along and seeing your amazing talents! A number of months ago a bunch of people rallied together to bless a dear lady. No doubt you've read about it on Juliet's blog. And here on Sammy's blog. A gift filled with love and kindness and caring - to show her that she was special, in our hearts and we cared about her and her family. The gorgeous blocks, materials and funds contributed to this quilt came from many different people and places. This is one of the best things about the blogging world - people rallying together effortlessly and doing what we can to support each other. This week is your last chance to link up to be in to win the Fantastic May Giveaway prize! 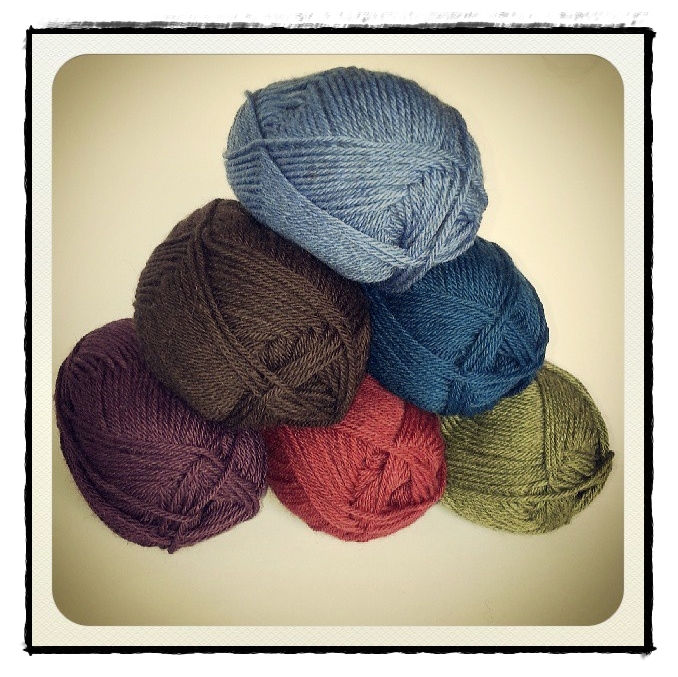 2 balls of each of the six solid colours of Skeinz's Moody Hues yarn range - worth $90!!! This is a delicious Merino, Alpaca & Possum blend that is soft and warm and comes in random colours and soon 8 solid colours. 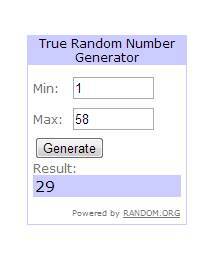 The winner will be announced next Thursday and is drawn using Random.org :) So go on - link link link! Looking forward to seeing your inspirational projects! PS: The house block is from Modern Blocks - the others were from my own templates or based on pictures or ideas pinned here. 2 Balls of each of the six solid colours from the Skeinz's Moody Hues yarn range - worth $90!!! A warm soft blend of Merino, Alpaca & Possum.... mmm snuggly... Everyone who has linked up during the month is in the draw to win! 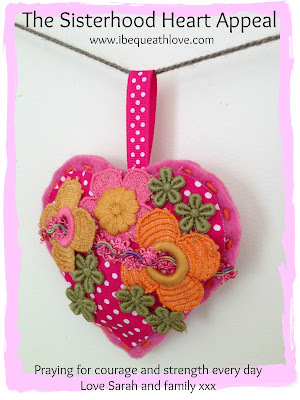 It has been such a delight dealing with Maree at Skeinz - so friendly, fast and helpful! Not to mention Generous! Skeinz & skeinz.com are the evolution of the small Knitters Factory Shop which was attached to spinning mill Design Spun. It’s creation came about when deciding the mill shops own fate & instead of chucking in the towel like many other retailers the decision was to jump in boots & all & expand, improve & diversify the store to create a place where yarn lovers from all around the world can get top quality New Zealand Yarn made from natural fibres at genuine factory prices. Skeinz.com is now recognized around the world for its work with contributions to help NZ Little Blue Penguins & is a Mecca for people seeking out Certified Organic yarns. The busy bricks & mortar store is open 6 days a week during the Winter & 24/7 at skeinz.com. Make sure you go and pay them a visit and support this great NZ business. You are bound to fall in love with their fantastic range of yarns - with something for everyone and every project. Thank you Maree and Skeinz for your time and very generous prize pack - it's been wonderful having you on board! Have a happy Wednesday everyone and don't forget to come back tomorrow to link up for the last chance to go in the draw! Are you able to whip up a heart? This week is the last week to join Sarah's lovely quest to send a special young girl and her family some love. Please hop over to Sarah's blog to read more about it and join this cause! Lets spread and send some love. Did you have a good nice warm and cosy sleep? Ready for another week? Hope so! 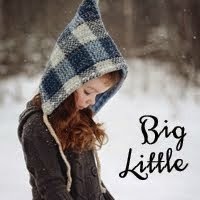 The super lovely and talented Lisa from Big Little is heading up a wonderful cause: The Hottie Project. 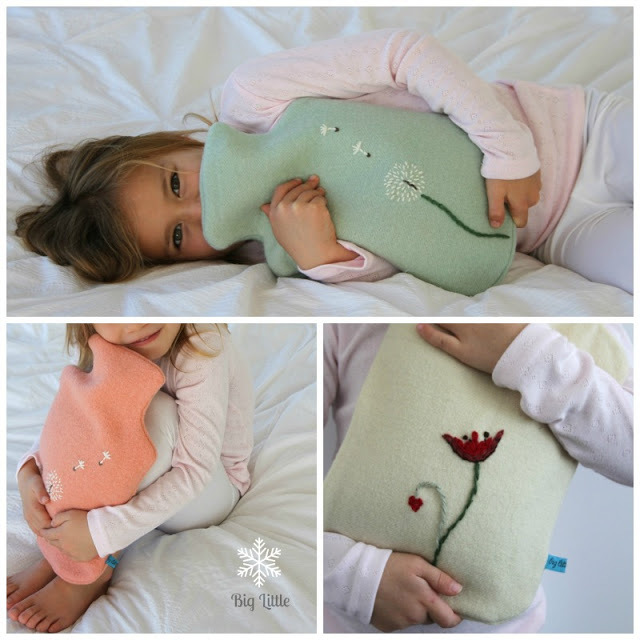 The aim: creating a BIG stack of lovely warm hottie covers to keep Christchurch children cosy this winter! Everyone can contribute in various ways - just head over to Lisa's blog for the details and to see how! Hope you will join in on this lovely project! I saw this pin a long long time ago and really loved it. So made my orange and aqua version. There is something adorable about hexies to me, not to mention very satisfying to work with! Dont forget the amazeballs prize this month! 2 balls of each of the six solid colours of Skeinz's Moody Hues yarn range - worth $90!!! This is a delicious Merino, Alpaca & Possum blend that is soft and warm and comes in random colours and soon 8 solid colours. All you have to do is link up at least once during the month to be in the draw : ). What sort of projects do you always enjoy working on? Looking forward to seeing this weeks' inspiring creations. A while ago I started seeing a few little crochet bunnies showing up in places. They looked cute and easy and I was on the lookout for a little gift for a little girl who incidentally loves bunnies! The bunny pattern is super easy and fun to make. And it has a cute little fluffy pompom tail! This month's winner will be receiving a prize pack from the wonderful people at Skeinz! It will consist of 2 balls of each of the six solid colours of their Moody Hues yarn range and is worth $90!!! This is a delicious Merino, Alpaca & Possum blend that is soft and warm and comes in random colours and soon 8 solid colours. It is Awesome! All you have to do is link up at least once during the month to be in the draw : ). So what have you been working on lately? Looking forward to see the goodies you'll be sharing with us! Took a while to grow on me but I like it now - 80's sync and all. Hi all you lovely people! A few months ago a lovely lady had a precious little boy... I took forever to finally get stuck in and create a wee pressie for him, but got there in the end! I first saw this on Pinterest and followed the crochet tutorial over here. Well written, clear and concise. And she even made the distinction and explained the US and UK terms! Very helpful! And now.... I have some very exciting news! Scrap the giveaway mentioned last week... We have a brand new awesome company sponsoring this months' giveaway! If you haven't heard about Skeinz yet, you should head over right this minute and go check them out! Then come back here and link up : ) Because this month they are giving the winner a prize-pack consisting of 10 balls of their Moody Hues yarn range. This is a delicious Merino, Alpaca & Possum blend that is soft and warm and comes in random colours and soon 8 solid colours too. Sounds great doesn't it?!?! Looking forward to seeing your inspiring creations! A few months ago I read about this great tutorial for fabric buckets on Deb's blog. Something I definitely wanted to do and make, and so I did! A couple of gifts for a couple of amazing ladies. The longest part was laying out all the bits to make sure they roughly fit and then sewing all those bitty pieces together. Some as small as 1.5"! Both were made entirely from fabric and scraps in my stash. I only had super stiff interfacing, so attached vertical strips at intervals to fortify the sides. It seemed to work ok.